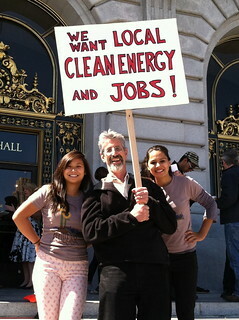 Clean Power SF will offer residents the option of purchasing 100% renewable energy starting in the Spring of 2013. Tuesday's vote approved a five-year contract for San Francisco to purchase up to 30 MW of renewable energy for participating customers. This will kickstart the program's goal of building hundreds of megawatts of in-city renewable energy resources within the first few years: installing 103 MW of local renewable generation and reducing energy use by a whopping 107 MW through energy efficiency upgrades. Meeting these targets would provide jobs for more than 4,000 San Franciscans during this period. San Francisco set climate action goals of reducing emissions by 25 percent below 1990 levels by 2017 and 80 percent below those levels by 2050. According to Ed Harrington, General Manager of the San Francisco Public Utilities Commission, Clean Power SF offers "the only chance of reaching those goals." Harrington also noted that Clean Power SF is "an incredibly efficient way to spend money...the City has spent $90 million on solar and other renewable energy projects that power fewer than 7,000 homes, whereas this $19.5 million will power 90,000 households." The program will initially include about 90,000 customers, or roughly a quarter of the city's residential ratepayers. Special thanks to all of our allies who achieved this victory together, notably Michelle Meyers, John Rizzo, David Gray, and Jeremiah Dean of the Sierra Club Bay Chapter; Eric Brooks of the San Francisco Green Party; Josh Arce and Eddie Ahn of Brightline Defense Project; and June Brashares of Global Exchange. Al Weinrub of the Local Clean Energy Alliance played a major role coalescing this group over the last couple of years. Twenty other community organizations as well as Senator Mark Leno, Assemblyman Tom Ammiano, and Senator Leland Yee also supported the program.